A distant star emits photons towards Earth, where they can be detected and observed, however there is a very dense object (a galaxy) directly between the distant light source and our observation stations (A and B) on Earth, which are both focused on the same distant star. Telescope A has a detection plate to simply measure incoming photons from any direction. The plate shows a 'wave-like' pattern, whereby photons (at least appear to) have existed in superposition, and somehow arrived at the detection plate via BOTH sides of the gravitation lens in between, and thus caused in interference or wave pattern on its detection plate. Telescope B also has a detection plate, but has extra sensors to indicate whether each photon was emitted (via the gravitational lens effect) via the left or right of the distant light source, millions of light-years away. The detection-plate on Telescope B shows a 'particle-like' pattern, because it has detectors to determine if each photon arrived from either the left or the right side of the distant galaxy, thereby collapsing the wave function of each photon detected, and in same instant determining whether each one arrived from EITHER the left or right side of the gravitational lens in between. All the way back, millions of years ago. These photons exist in high-resolution ONLY because we are looking so CLOSELY. Q: If Telescope B detects a photon arriving from either left or right of the intervening galaxy, would Telescope A have detected the same thing if Telescope B was offline? That creates a profound retrospective causality effect that surely must be further explored? 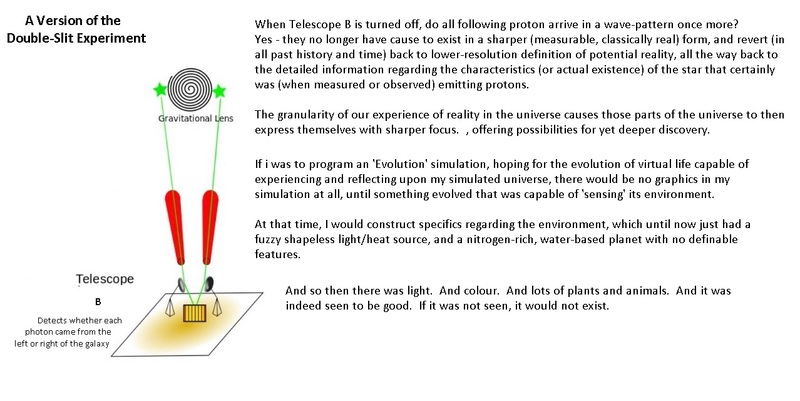 Q: If retro-causality occurs in scenarios such as the 'Deferred Reaction Double-Slit Experiment", what laws (or quantum-mechanical rules) determine the maximum possible time-elapse (BACKWARDS in time)? If sub-atomic particles and reactions to causal experiments act consistently in this way, is it possible for retro-causality to occur at SLOWER than Planck scales? Or must it be so instantaneous as to allow an emergent sub-particle and anti-particle to have collapsed before this type of observation can even be made? Q: Assuming retro-causality (at least in Planck-scales) is a real phenomenon, what would prevent these from being chained together, almost like a current of electrons, so as to affect the past in a meaningful physical way? Q: Given that retro-causality is a proven phenomenon at the most basic known substrate of physical reality, how is it possible that our thoughts and experiences DO NOT affect the past in a real way? Even MORE SO than evidence that our past or current actions or states of mind craft our FUTURE existence or reality? Feedback welcome, thanks for reading. Your question has a lot in common with the basic 2 slit diffraction experiments. 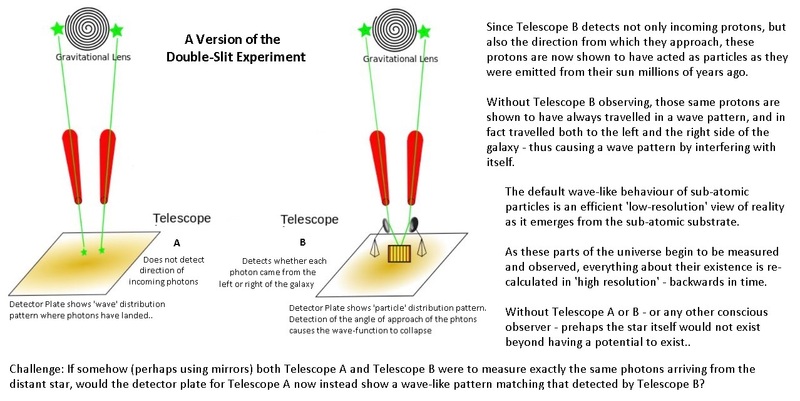 The 2 slit experiment has been explained classically for many years and the explanation served its purpose but the later deeper analysis using single photon sources further showed how the photon wave function provided a fuller explanation. Using the photo plate the diffraction pattern is seen, the wave function(s) of each photon(s) collapses at the plate having been affected by both slits. By closing a slit or putting a detector in the slit to try and figure out which slit the photon passes changes or collapses the wave function. But in all cases of detection the wave function has collapsed. I think in your case A you will still observe a diffraction pattern that is eventually built up if photons were received one at a time. Also turning of A or B will not affect each others detection of photons, the detectors are merely observing different photons or (individual wave functions) with different apparatuses. Dark spots in the interference patterns were thought to be cancelations but in reality they have been shown to be positions where there are no collapses or photons occurring. I can't follow all your thoughts above but I mention the photon wave concept so that it helps to add to your thought experiment. Not the answer you're looking for? Browse other questions tagged quantum-mechanics quantum-information double-slit-experiment wavefunction-collapse or ask your own question. How is wavefunction probability redistributed after partial wavefunction collapse? Can the absence of information provide which-way knowledge?